Aloha! This week is a double hitter! We’ve just posted last weeks update (I apologize for the slight tardiness,) and here is a current update on events going on around the farm! 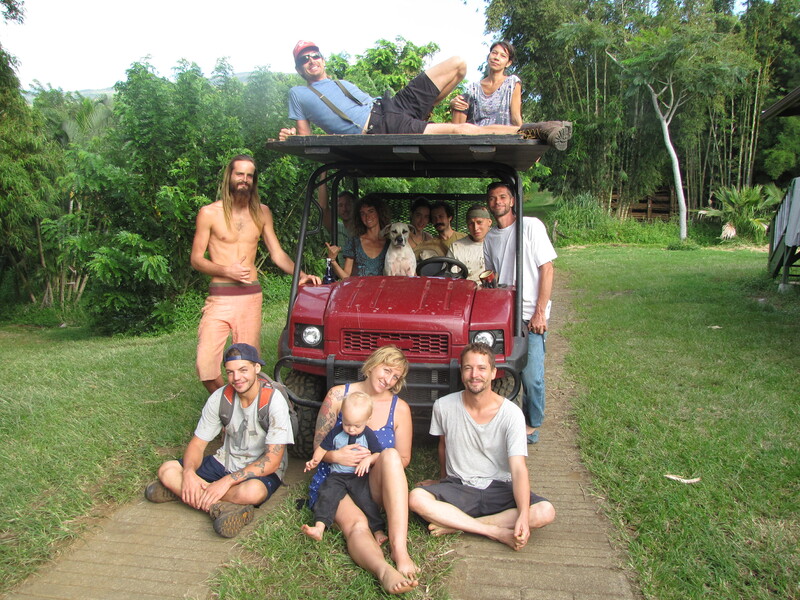 Just before jumping into the weekly goings-on; we here from the farmily would love to give a huge shoutout and gift of love and positive vibration to Rich. He’s basically the headmaster of Hogwarts over here, so to speak. This picture is for you! This week has been an extremely exciting week! Let’s get into the goings-on. Come Monday after a very refreshing weekend for us all, we gather together to have a “clearing.” This is an opportunity for meditation and reflection; set aside from the normal work day. During which we all sit together for a small period, then allow space for each person to speak in turn. This can be about anything going on in his/her experience. A recent revelation, an idea for the efficiency or betterment of our work/community environment, or to smooth out any creases in intercommunity relations. We then split into two teams. 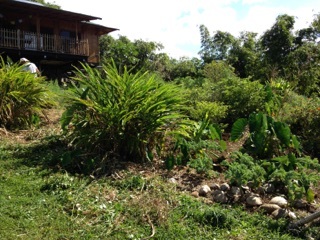 One team worked in the nursery, preparing a number of “starts” or plants that have been in potted soil long enough to be given a permanent home in our gardens or around the farm. 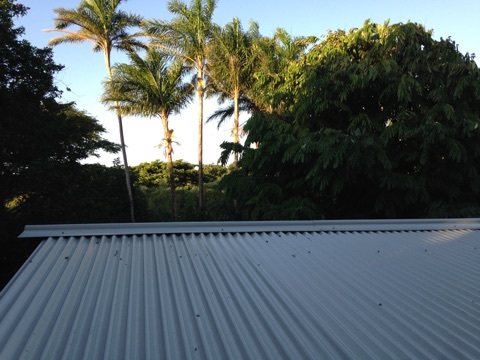 The other team was tasked with working in the Quonset. 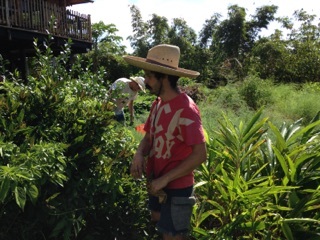 While three of our “bamboo hunks” worked to process some recently harvested Appis, Guadua, and Indonesian Asper. Some of which is going into our pressure vessel to be pressure treated with the Borate solution. As well as unloading the last load of poles that were treated and setting them aside to cure from our latest bamboo harvest. 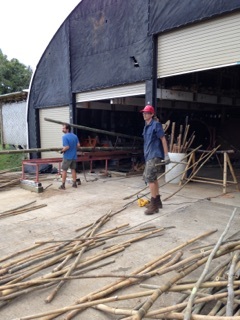 The remaining two of our Quonset team worked to construct more columns for the new bamboo structure project. In addition to some regular tidying around the building, we assembled another three columns before the days end! Tuesday was looking exceptionally beautiful here, and the sunshine was not to be wasted. Gabe, our farm infrastructure man got to work on replacing the roof on one of our small structures on the farm. Slight showers looked to be troublesome around noon, but the sky cleared up and everything went smoothly. With a small bit of assistance, it was completed all in one day! A large deal of forest maintenance was done in the areas around our nursery, shop, and shade house to show and give a bit of love to these areas. The “shade house” is an area where the majority of our freshly propagated plants and bamboos live. Most of the day’s work was dedicated to this. Our next highlighted blog update will involve our Nursery. We will be sure to include detailed photos of the area that will show off the recent improvements! On Wednesday as we are all excitedly awaiting the return of our fearless leader Virginia, we dove into her garden and made it look fresh and inviting. All of the plants reacted in kind, responding by lifting up and looking their most vibrant; looking forward to the love that will most assuredly be provided to them by Virginia on her return! We knocked this out with enough time to also complete a heavy mulching session behind our pond garden, and in our lower garden. First we “sedged” which is code for the removal of a certain pesky weed “Nutsedge.” Quite delicious, and is said to have medicinal property. Anyhow, following the “sedging” we then dove into the pond and gathered the pond lettuce that makes for such great mulch. It is dense and filled with moisture that will be retained for months after being placed on the beds. Plus, it’s really relaxing and fun to have a mid work day swim in the pond. 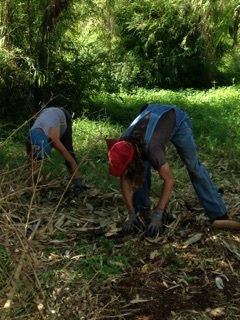 We also utilized the fallen leaves of our nearest mature Malay Dwarf bamboo hedge. This makes for good mulch as it is Silica rich, and is especially abundant. 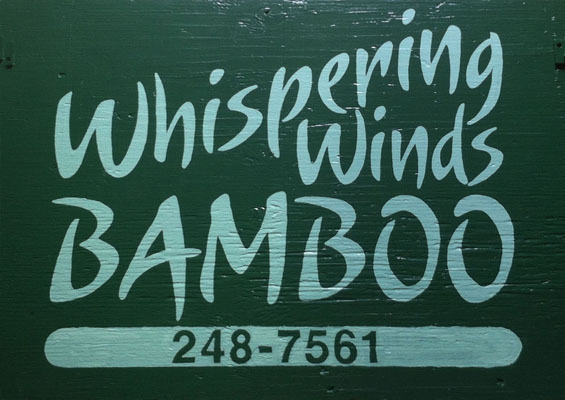 We have no lack for bamboo here. Master mulch collectors at work! 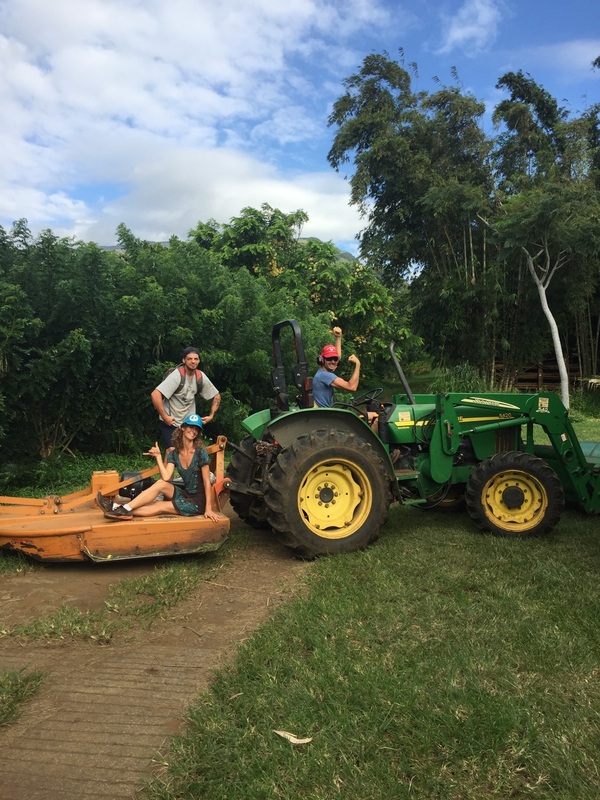 As per usual, once Thursday came around we were saddled up and ready to rock with our produce harvesting tasks. If you’re curious as to what is involved in our produce harvest days, feel free to check out our previous blog update “Whispering Winds Weekly Sep 28th – Oct 2nd where our produce harvest day is highlighted in detail! It was not the heaviest day in terms of the requirements and orders given to us, so we worked quickly and also were able to move our herd of cows to graze freshly in a new pasture. This happens once or twice weekly and involves using plastic standing rods and electric tape. Here we are gearing up on the tractor to do the job! Once we have set up our newest pasture using the equipment, we ease the cows in from the old pasture. Fear not, our cows are extremely happy and exhibiting all natural tendencies. They are allowed to live a happy life, with a grass-fed diet. They absolutely love the freshly grown tips of each tall grass sprout. The electric tape serves as nothing more than a barrier to encourage them to stay within their given area for a small amount of time. It doesn’t hurt the cows as much as it just nudges them; making them shy from too much exploration at once. They rarely come into contact with the tape, and have become accustomed to the regular moving pattern we rotate them on. We will also be highlighting our farm animals in the updates to come. This will include more adorable photos of the cows than any one person can possibly handle! We’re thoroughly excited to receive Virginia and Rich back home to the farm this coming Monday! We all hope your trip was fulfilling and unexplainably awesome! We can’t wait to hear about it.